Q: What is a charging station (EVSE), and why is it required? A: The technical name for these products is EVSE (Electric Vehicle Supply Equipment), commonly called a charging station or charging dock. These charging stations are built into the EV charging standard for electrical safety; first for the user, then the vehicle and then the power grid. The charging station’s primary function is as electrical safety equipment. 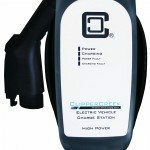 A standard home charging station, whether it is a Level 1 (120V) station or a Level 2 (240V) station, will provide pass-through AC power to the vehicle for charging. The vehicle converts this AC power to DC power and uses that to recharge the batteries. The actual charger is on-board the vehicle. A charging station uses several layers of redundant safety features to protect the user from electrical hazards while connecting and disconnecting the station to the vehicle. Once connected to the vehicle, the station informs the vehicle that power is available and at what level. From that point, the vehicle takes over, initiates and takes full control of the power transfer (unless an electrical fault occurs, in which case the station will stop the power transfer immediately). Buy our products or locate detailed information about our products, including product brochures, installation manuals and pricing at ClipperCreek.com.Our customer service team is available to assist you with any questions you may have Monday-Friday from 8-5 PT. You can reach them at (877) 694-4194.
we are prime contractors for a new industrial park near vancouver, B.C. we are installing one EV charging station near the entry of a new admin building. we have not previously purchased EV units, thus need a bit of quidance in the purchase.